Flat-Woven Rugs have been made in many areas for thousands of years. The designs come from the dyed wefts.There are no knots and therefore no pile. There are generally less expensive and less durable than knotted rugs. Flat-Woven Rugs are lightweight, easy to handle and normally reversible. A favorite of many decorators! A knot is the term used for a strand of wool yarn which is looped around two adjacent warp threads and then cut to form the pile (surface of the carpet). Is one knot better than another? The average weaver ties more than 10,000 knots a day…each one by hand! Each oriental rug is a work of art, but some styles do have an advantage over another. It does not leave the gaps between each knot. It can make a finer design. 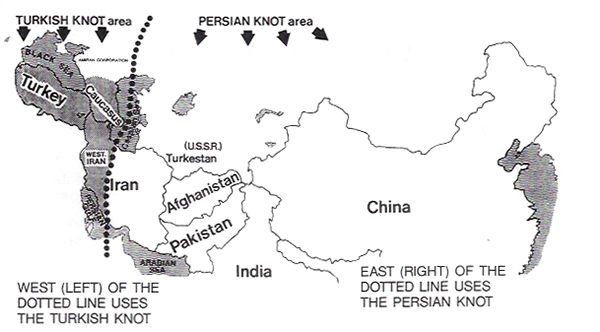 Traditional Persian Knot used in India, Pakistan, China, Iran (except the western part), etc. The hand-tufted rug looks and feels very much like a hand-knotted rug. This is because it uses the same fine wool and dyes as the fine knotted rug use. It differs in the construction method. Instead of tying each knot by hand, the tufted rug is made a with a tufting gun from the back of the rug. (Rug hooking is similar but done from the front.) This method saves a lot of time and keeps the price of the rug much lower than a knotted rug of equal size. 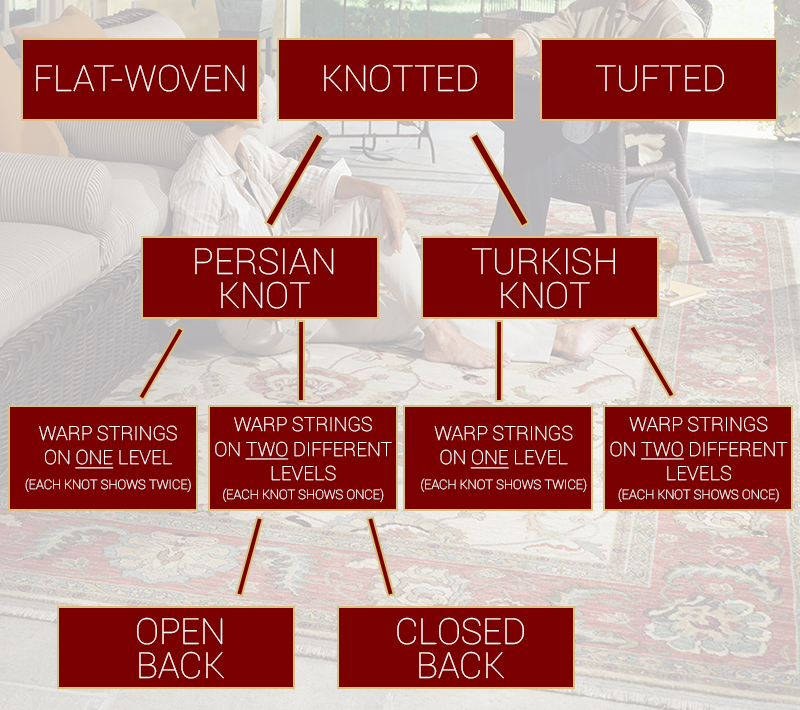 Buying an Oriental Rug from David Tiftickjian & Sons is educational and fun. There is much to know when selecting an Oriental Rug and we assist each customer based on their aesthetics and budget concerns. Visit either of our two locations and start your journey to finding the perfect rug.